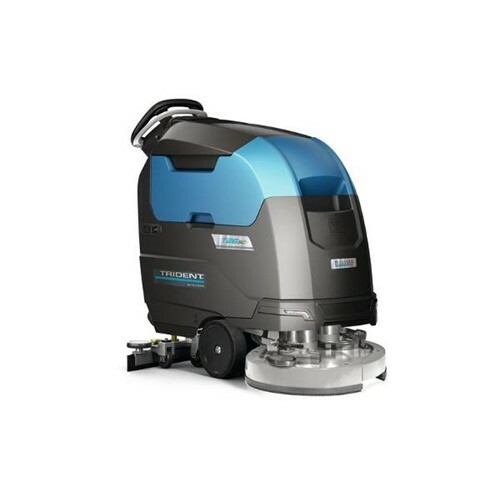 The Hillyard Trident T20SC Pro is a technologically advanced walk- behind, traction drive, automatic scrubber that makes cleaning simple and easy. Its designed to deliver high productivity and low total cost of ownership. An innovative aluminum chassis designed to last a lifetime is corrosion resistant, sturdy and durable, light weight, and provides a precision fit for components. Clean up to 19,000 sq. ft. per hour with the 20" scrub head. The intelligent design allows the T20SC Pro to easily travel through even tight spaces. The LED service lighting system enhances safety and makes it easy for routine maintenance by illuminating the squeegee assembly, brush assembly and battery compartment. Equip the T20C Pro with the optional LED driving light kit to enhance safety. Cleaning deck power is delivered with the T20SCs consistent cleaning power engineering. Select from one of three cleaning power levels to match the right level of power needed to remove the soil load encountered. Constant micro-adjustments of the brush deck maintain consistent amp draw on the motor and provide the ability to clean even the most aggressive surfaces without damage to the motor. Consistent cleaning power is a key factor in extending motor life and delivers improved cleaning results. The T20SC Pro comes with onboard battery charging, simplifying recharging. Innovative technology brings the optional Hillyard Fleet Management System to the T20SC Pro. With HFM, your cleaning organization joins the connected cleaning world where wireless technology provides location, usage, maintenance status, and telemetry data to help you maximize your asset investment, extend the life-cycle, and deliver the best results at the lowest total cost to clean. Have peace of mind that your investment is backed by Hillyard, a 110 plus year old family company with the Hillyard Customer First 10-3- 2-1 Warranty program. Pressure on the brushes is kept constant, delivering consistent high cleaning results. The largest tanks in its class: less stops to fill/empty the tanks. The powerful 2-stage vacuum motor immediately dries the floor, reducing the chance of slip/falls. When the machine is idle, the brush motor, vacuum motor, traction and detergent pump will turn off automatically, reducing costs and emissions. All the functions are reactivated automatically as soon as the operator accelerates. Front LED headlights maximize safety in all conditions. Standard on T26SC Plus, optional on T20SC Pro models. Automatically operated safety break engages when the machine stops. It acts as a safety parking brake. One-touch service contact in case of emergency. Pushing the red button will automatically send an e-mail to the authorized Hillyard service department on record. The service department can quickly act. The operator is the center of a high-tech universe, where everything is easy and intuitive. The high-definition color display offers the same intuitive experience as a smartphone. Making technology available to improve efficiency is one of the core missions of Hillyard. It gives you the power to make the right decisions for your cleaning program. HFM, the Hillyard Fleet Management system collects data sent by connected cleaning machines. When the machines are operating, valuable machine information is transmitted and easily accessible in real time, 24/7, from your smartphone. Being constantly connected to your machines will help you operate them even more efficiently and effectively. Know where your machines are, and if the operation is being carried out according to plans at the scheduled time. Machine health is constantly monitored. In the unlikely event of a breakdown, you will receive an alert notification directly on your smartphone, allowing you to promptly take corrective action and immediately call technical support. Easily check the battery conditions and the quality of the charges in order to optimize battery endurance and life cycle. The sensors provide hard impact feedback. Now you will know how the equipment is being used. Its time to get your cleaning world connected with Hillyard Fleet Management.